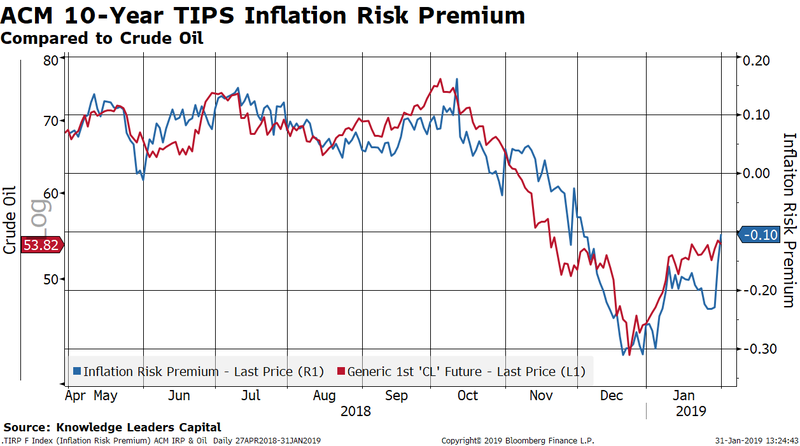 The slide in oil prices in October accounted for most of the move in 10-Year US Treasury bonds via the inflation risk component of the term premium. The two series are always highly correlated and this is a mechanism through which oil price changes are incorporated into US Treasury pricing. This year, there are two new dynamics at work in the bond market. The first is falling TIPS yields, which offers some information about the growth outlook. 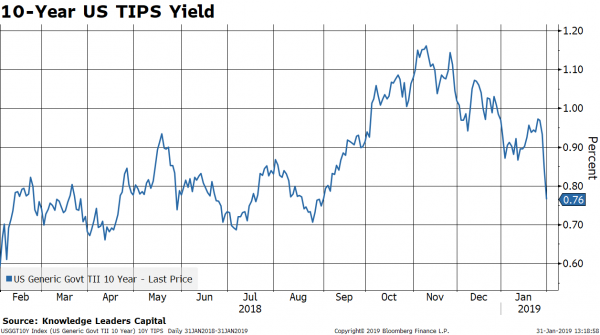 The yield on 10-Year TIPS has fallen from about 1.15% in October to 76bps currently. For a security with a roughly 7-year duration, that 40bps decline in yield is a decent 2.8% return… when equity markets have lost 10+%. 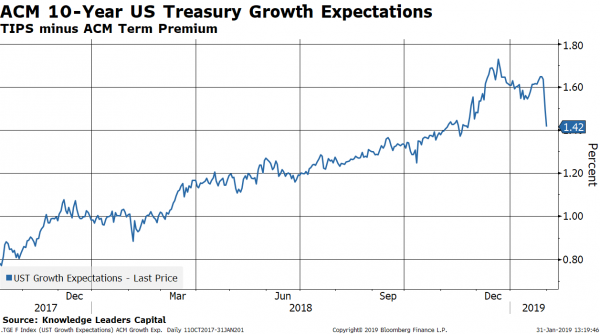 If we subtract the term premium from TIPS yields, we get a derived growth expectation. Normally, the term premium is a positive number, so derived growth expectations are below the TIPS yield. 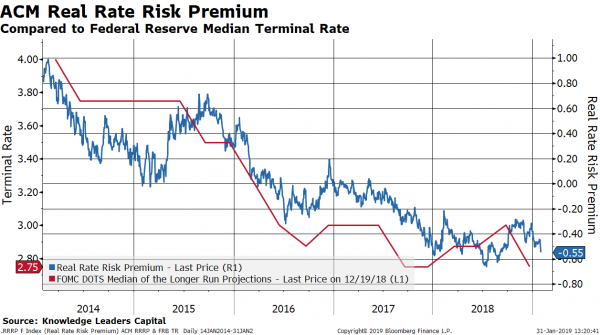 Over the course of multiple rounds of QE, the Federal Reserve hammered the term premium well into negative territory. 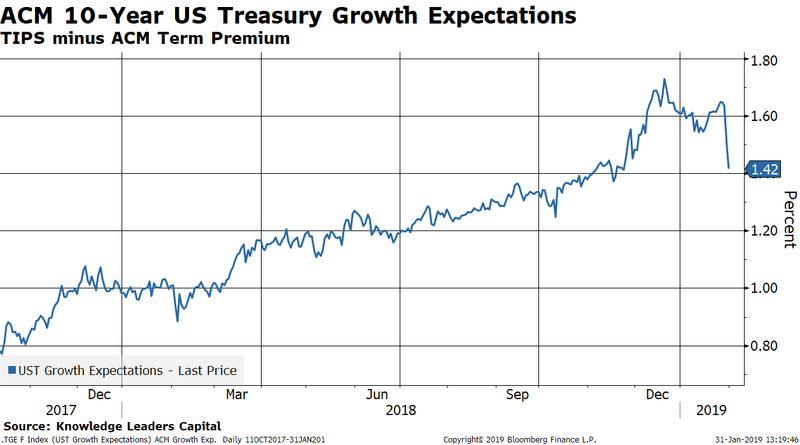 So now when we calculate derived growth expectations, we are subtracting a negative number, so derived growth expectations are higher than TIPS yields by the amount of the term premium. In the chart below, we can see that derived growth expectations have dropped pretty swiftly over the last couple months, from about 1.7% to about 1.4%. The second thing that has changed in the US Treasury market this year is the driver of the term premium. As mentioned earlier, the term premium was driven lower last fall due to the drop in oil prices. 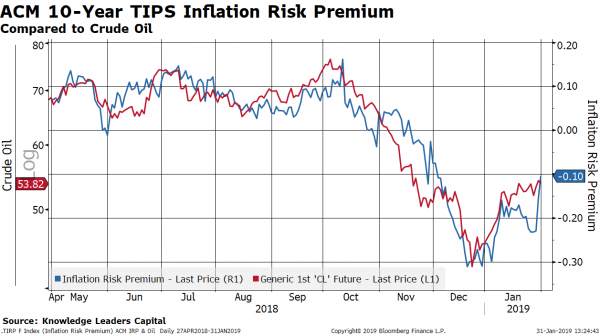 With oil prices recovering, the inflation risk premium is now rising. But, the new face on the Fed has the real rate risk premium now diving. This component of the term premium is directly related to the Fed’s forward guidance, balance sheet size and reaction function. Yesterday, we got news that forward guidance with respect to further rate increases was basically removed, the pace of balance sheet run-off is in play (with the prospect even raised that the Fed may be confronted with the zero lower bound again and would respond with increases in its balance sheet) and that the Fed’s reaction function has changed from blindly raising rates to the range of neutral, to clearly saying they are now in the range of neutral and data dependent on next rate move… which could be either up or down. There was lots of shock and disbelief among commentators yesterday, with the common refrain that Powell caved to political pressure and did a 180 degree turn from his and the FOMC’s seemingly more hawkish stance as recently as December. While Powell was more dovish than I would have expected, the FOMC did tip their hand recently by lowering the terminal rate when they presented their last Summary of Economic Projections (the so-called dot-plot). This rate is highly correlated to the inflation risk premium and acts as a signaling mechanism to bond traders. 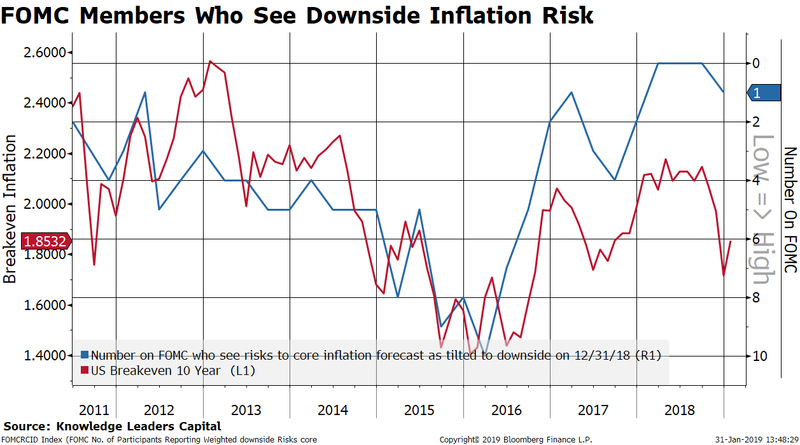 A likely cause of the drop in the terminal rate was a response to a change among the FOMC members who see downside risk to inflation. 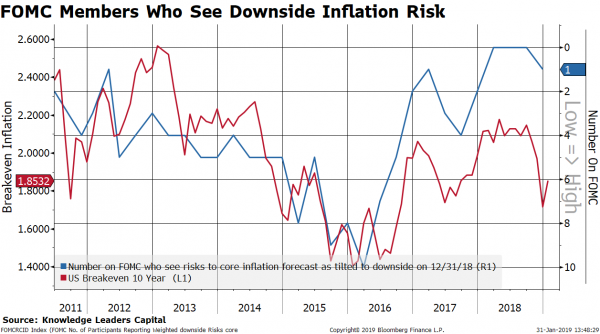 Here again, oil prices are well correlated to the perception of downside inflation risk, so the drop in oil impacted the Fed’s perceptions of the inflation outlook. 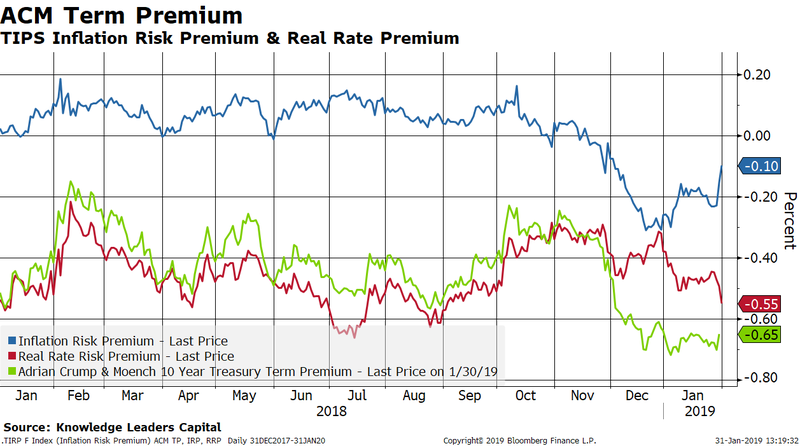 As of this writing, the 3-month US Treasury Bill yields 2.34% while the December 2019 federal funds contract trades at 97.66, implying a fed funds rate at year’s end of 2.34%. The December 2020 fed funds future is currently 97.83, suggesting a rate of 2.17% by the end of 2020. Looking at fed funds futures quarterly, through the end of 2020, the curve is now flat or positively sloped at each interval, suggesting the market has moved from pricing in any Fed tightening to now speculating when and how fast they may be cutting rates. A new year and very new expectations in the US Treasury market.